Highland FFA officers are shown with eighth graders during a recruiting trip. SPARTA — On Tuesday, Jan. 30, our Chapter’s Officers went to Highland Middle School to talk to 7th and 8th graders about joining Ag. When the students are in 8th grade, they start their scheduling for their Freshman year. Each student gets the opportunity to choose three electives, as well as some of their core subjects and classes. Electives can include art, gym, study hall, band, photography, etc.. Another elective is Ag. Ag 1, the Agriculture class offered to Freshman, is called AFNR, (Agriculture, Food and Natural Resources.) In this class, students learn mainly about plants and animals. This is the class that 8th graders will select if they want to join Ag. Not only will choosing AFNR enroll the student in an agriculture class, but it will also make them a member in our FFA Chapter. Each year, our Chapter loves to meet freshmen members. These freshmen are known as Greenhands, as they will be working to get their Greenhand Degree throughout the year. At the beginning of the year, we even have a meeting dedicated to only the Greenhands, explaining to them and their parents what the next few years of FFA will be like. What a lot of people don’t understand is that FFA is more than farming. It’s an opportunity to grow in many life-skills such as leadership and responsibility. CDEs (Career Development Events) are a great way to grow in these skills. In FFA you also gain knowledge about agriculture and how today’s farming industry is growing and impacting the lives of farmers. Students get the chance to help improve the community, participate in activities, compete in competitions, go on field trips, learn about tons of things, and much much more. These reasons, along with many others, are why 8th grade students should enroll in Ag when they’re doing their scheduling. On Tuesday, after introducing ourselves to the middle schoolers and explaining all of this to them, we played a fun game of cow ring toss, where the students had to throw rings around cow-decorated milk jugs. We had a ton of fun with the 7th and 8th graders and hope to see them in FFA during the next few years. 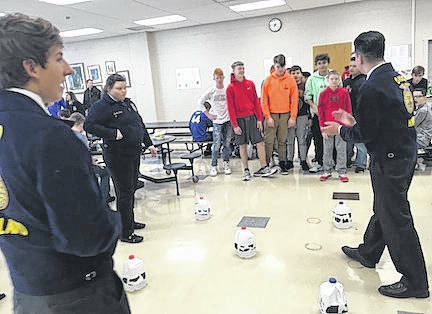 https://www.morrowcountysentinel.com/wp-content/uploads/sites/29/2018/02/web1_IMG_E6770.jpgHighland FFA officers are shown with eighth graders during a recruiting trip.